Dmytro Storozhuk, Yevhen Yenin and Valentyna Telichenko will serve as deputy chief prosecutors. The Prosecutor General Yuriy Lutsenko at a news conference on 30 May presented his team. 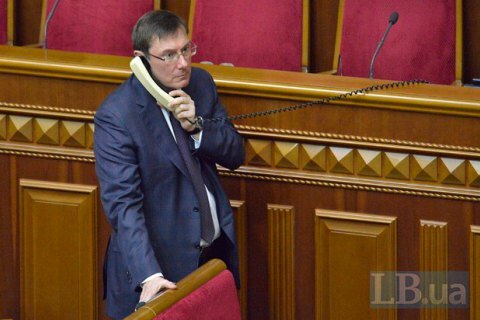 MP Dmytro Storozhuk is appointed Lutsenko's first deputy. He will be responsible for the supervision over the observance of legislation in the Security Service, State Financial Service, Customs and the National Police. He will supervise the Department of Supervision in Criminal Proceedings, led by Volodymyr Bedrikovskyy. Deputy Prosecutor-General Yevhen Yenin will focus on international cooperation and cooperation with the Ombudsman, representation of the interests of citizens and the state in courts. Previously. Yenin was a counsellor of the Ukrainian Embassy to Italy. A prominent lawyer Valentyna Telichenko was appointed another deputy chief prosecutor, whose main area of responsibility is the reform of the prosecution system, including holding a new competitions in local prosecutor's offices. Central Investigation Directorate will become a department under the direction of Yuriy Hryshchenko, who will supervise 120 investigators of the Prosecutor-General Office and 72 investigators in the regional prosecutor's offices. The head of the Department (as opposed to Directorate, as previously) of Special Investigations will remain Serhiy Horbatyuk, overseeing the work of 117 investigators of the Prosecutor General's Office and 34 investigators in the regional prosecutor's offices. The department for investigation in the economy will be headed by Volodymyr Hutsulyak. He will lead 23 investigators. Volodymyr Zherbitskyy was appointed the head of a special group of 15 prosecutors for the investigation of major economic crimes in times of Yanukovych. Together with the Department of Horbatyuk he will be in charge of bringing indictment in the case of the organized criminal group by Yanukovych. Petro Shkutyak, who earlier serves in the volunteer battalion Aydar appointed the head of the working group for the internal security. Bogdan Witwitskiy must lead the competition commission for the selection of candidates the PGO General Inspection. He will report immediately to the prosecutor-general.